Unicorn Smasher PRO 1.1 is here! Bring out the champagne and strawberries and let's dive into what’s new. - Unicorn Smasher is now available in the UK and DE regions — Guten Tag Mates! - Our opportunity score is now optimized to give you an even better idea of competition within your niche. - You can now select products individually for export and research. - New filter options allow you more control over your searches and results. - The display window has been released from the top right of the screen and can now be moved around freely. - You can now see which products feature sponsored ADs. 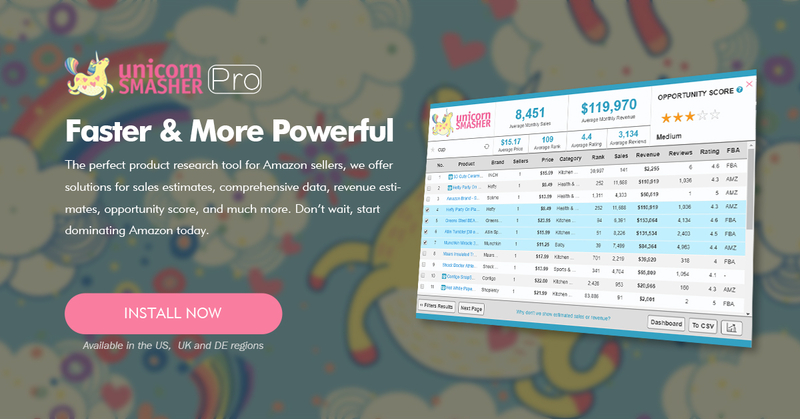 Find your perfect product today with Unicorn Smasher Pro.